Pugs make such wonderful pets, particularly for those in their Third Age – broadly speaking, the Over 50s. 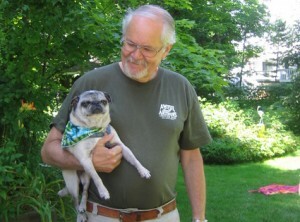 Pugs in particular make wonderful companion dogs for the elderly. Their willingness to adapt to their owner’s needs makes them the ideal companion dog for any Third Ager, requiring only as much exercise as their owner is able to provide. We often get asked, when people live in apartments/flats how much outside time pugs need and the answer is very little. One walk a day they will be content with – their most overriding desire is company. They will follow you from room to room, in and out of the garden, they will be as active as you are. People who are retired are excellent owners for pugs and if you can not spend a lot of day time with your pug we strongly recommend that you get another dog companion, of any breed and they will be happy to await your return. If left on their own with no other dog for company pugs get separation distress and this can causes ill health. So if you are in your Third Age and looking for the ideal companion dog, you could do a lot worse than buying a Pug! When you do after reading this please remember to thank us for making such a great recommendation. My family and I came across a pug a few weeks ago and ever since we haven’t stopped discussing adopting a pug, as the cost of buying would strain our income, also we feel adopting a pug that needs a loving home would be more helpful. We have a big garden and live in walking distance of a beach so exercise would be no problem at all. My wife works part time and i’m self employed and work my shifts around my wife so the dog would have plenty of company. I think our family home could provide a perfect loving environment for a pug. I agree…Pugs are wonderful little characters and amazing companions..I would dearly love one. I have a wonderful forever and a day home waiting for one and an enormous garden to potter in. Unfortunately there is one thing preventing me from having one and that is the extraordinarily high price of pugs £1000 -£1500 is just out of the reach of most Third Agers. This is such a shame there are a lot of us who could offer pugs a love filled happy life but are unable to pay such a high price for a puppy. I am doing my best to save but these days it is very difficult. I would have thought breeders should consider a wonderful lifelong home for their puppies a priority rather than financial gain? Obviously not. Pugs appear to be bought as a trendy fashion accessory these days and prices have soared accordingly. It’s a great shame. I rescued a Pug of 13 yrs. Pugsley is now 14 yrs. old. He was at a rescue place . I was told that dogs cost $ 250 there , They didn’t charge me anything because he had issues. I sincerely hope that you get lucky and find a senior dog to love and be loved. I look after a Pug for a young couple who otherwise would not be able to have her.while working alday. I feel humble to help them out. while having a Pug in my care,Your site has givenmore insite imformation on them. Thank you again for a wonderful site..